The method worked best when the infusions of CD8+ Treg cells were given at the same time that the animals were injected with a protein that triggered the arthritis-causing autoimmune reaction. “We found we could almost completely inhibit the disease in this setting,” saidHarvey Cantor, MD, chair of the Department of Cancer Immunology and AIDS at Dana-Farber and the study’s senior author. 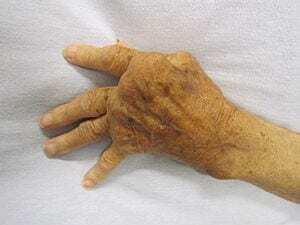 Even when administered weeks after the disease was initiated, CD8+ Treg infusions combined with low doses of methotrexate — a commonly used drug for rheumatoid arthritis — were able to significantly slow the arthritis process, the scientists reported. The new strategy also blocked disease progression when the scientists injected peptide antigens to expand the rodents’ own pool of CD8+ Tregs, rather than infusing them from outside. Overall, the results “suggest that [these] strategies represent a promising therapeutic approach to autoimmune disorders,” the researchers wrote. In autoimmune disorders, however, parts of the immune system attack the individual’s own healthy cells and tissues — the result of the immune forces failing to recognize “self” identifying tags on the body’s cells. An estimated 50 million Americans suffer from autoimmune disorders, which include rheumatoid arthritis, lupus, type 1 diabetes, multiple sclerosis, and celiac disease. At least 100 different autoimmune diseases have been identified, and are more common among women. The incidence of these diseases is rising in the United States for unknown reasons. Rheumatoid arthritis is caused by inflammation throughout the body, attacking many tissues, especially the joints, frequently causing painful and deformed fingers and hands. About 1.5 million Americans are afflicted with rheumatoid arthritis. Drugs of several types, including corticosteroids, are given to reduce inflammation and slow the disease. The newest treatments are biologic agents, which block secreted chemicals called cytokines that carry out the misguided attacks. However, even with these agents — which can have serious side effects — rheumatoid arthritis treatment is often not optimal, said Cantor. In contrast to these “downstream” players in the complex autoimmune cascade, the strategy described in the new report is aimed “upstream,” where the attacks begin with overactive immune fighters, called T follicular helper cells, that mistakenly respond to “self” markers on healthy cells. These T cells can become chronically overactivated, spurring a continuous attack by antibodies on the body’s tissues.